For the past months Maurice Kirya’s staunch fans have been yearning to see him on stage performing the many hit songs he has released in the past moths but the good news is that the biggest soul music artiste in East Africa Maurice is finally in concert again and you don’t have to wait any more, he recently mentioned Friday 2nd November as the day when most girls will again carry ‘Marry Me Kirya Placards’ during his annual concert. The show is dubbed ‘Kirya Live 2018’ hosted at the Kampala Serena Hotel International Conference Hall starting 7:30 Pm on 2nd November 2018. 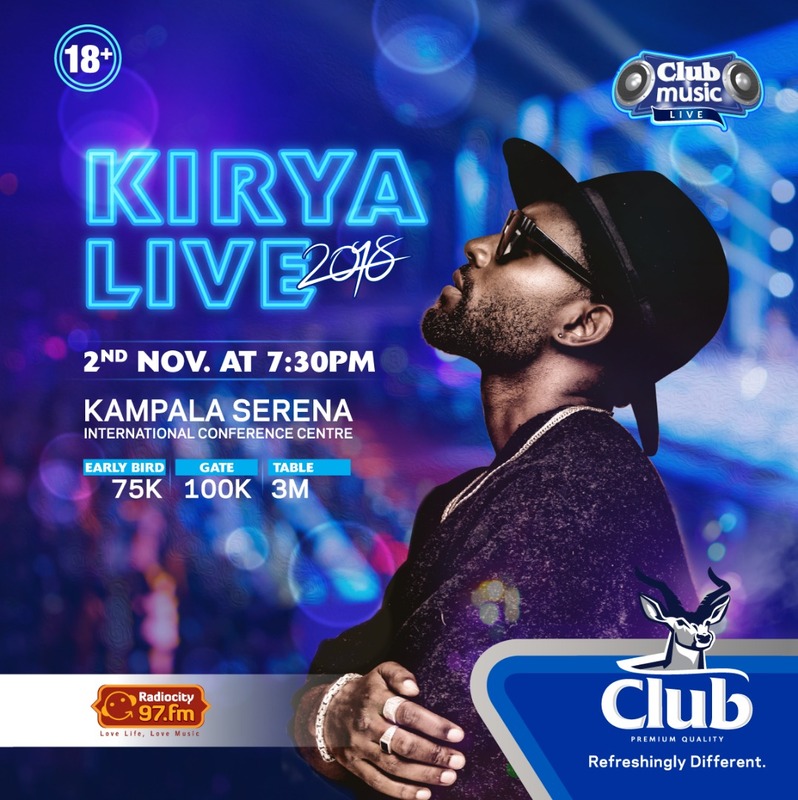 After crisscrossing the world, doing shows in and out of the country, and even becoming a dad in the process, singer Maurice Kirya is back with Kirya Live 2018. The renowned RnB singer will be offering a unique musical experience that’s incomparable for his fans performing several of his hit songs like Insane, Malaika, Woowe, Busabala, Misubbawa that literally kept his musical candle burning. From the angelic Malaika to BodaBoda who took fans on an enchanting ride without forgetting his new standard hymn Nze Ani. In the past, Maurice Kirya’s music shows have given young and promising artistes in the same music genre an opportunity to expose and sell their talents to the fans including singers like Kenneth Mugabi among others and it seems Kirya is not about to stop to promote young artistes because this year’s Kirya Live will feature the talented Shifah Musisi, JC Muyonjo, and The Body of Brian. The talented Maurice Kirya will be performing at Serena Kampala hotel this Friday, early bird tickets will go for 75,000 shillings, gate at 100,000 and 3 million VIP tables. Take your loved ones for a memorable experience from the king himself. Be there. Kirya Live 2018 is proudly sponsored by Club Pilsner and 97 Radio City. Flash Uganda media will be there to keep you updated.